Las Vegas is the world’s grown-up playground. Those who choose to vacation here expect top-of-the-line lodging, dining and entertainment. 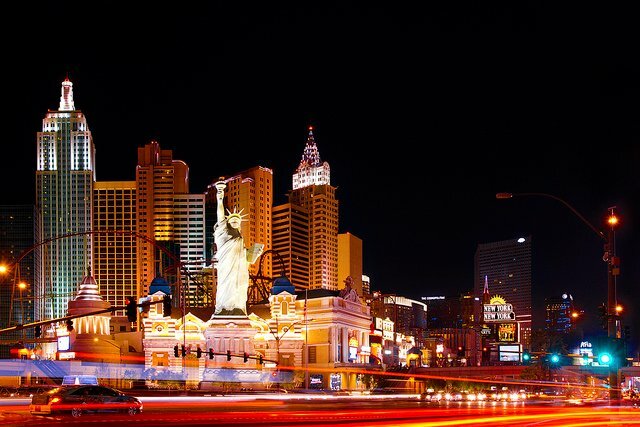 Luxury abounds in Sin City and choosing the perfect resort on the strip can make or break your vacation. Let’s take a look at the wonderful Hilton options on the strip. The Elara Las Vegas by Hilton Grand Vacations Club dark glass tower rises iconically over the strip. 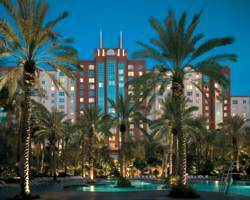 This resort is primely located and sits adjacent to the Planet Hollywood casino. It’s also within close proximity to the Miracle Mile shopping center, which includes major retailers like Sephora and Marciano. The Elara itself does not have an on-site casino, but it’s close enough to the strip to keep you entertained. One advantage of staying in a casino-free hotel: quiet relaxation by the pool. Dining options are nearly endless on the strip, but there are great options inside the hotel as well. Aside from excellent in-room dining, the lobby bar offers fantastic cocktails, beer and grab and go dishes. Outside by the pool, the poolside bar offers a collection of well-crafted cocktails. For those who can’t go on without their caffeine fix, the lobby Starbucks will be your favorite destination. The Elara’s luxurious suites definitely don’t disappoint. 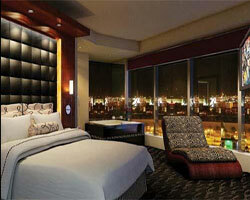 All rooms feature floor to ceiling windows with incredible views of the strip. Accommodations range from studios to four bedroom suites with full kitchens, home theaters and washer/dryers. Just off the strip on beautifully manicured ground sits the Flamingo. HGV Club at The Flamingo is an oasis on the strip, with its own wildlife sanctuary filled with colorful flamingo, ring teal ducks, sacred ibises and koi fish. If you need a quiet place to get off-the-strip just for a moment, head into the Flamingo’s wildlife sanctuary. Continuing the trend of relaxation, the Flamingo is home to an excellent, full-service spa offering a wide selection of treatments, including the thermal seashell massage, Alaskan mud facial and a desert detox body wrap. The Flamingo also keeps the nightlife scene lively with a series of shows in a variety of shows for all types of audiences. Frequent shows include Donny & Marie, comedian Piff the Magic Dragon, and a selection of burlesque shows are all available just steps away from your hotel room. Hungry before the show? Dining options on-site offer an incredible array of flavors sure to satisfy all palettes. Eight on-site restaurants guarantee that your taste buds will be happy. The Paradise Garden Buffet offers features Cajun and southern dishes in a buffet style restaurant with incredible views of the wildlife sanctuary. If you’re looking for a more upscale experience, consider the Center Cut Steakhouse where you can indulge in a sizzling porterhouse steak and a decadent slice of chocolate cake. If a casual experience is more up your alley, head to the Carlos ‘n Charlie’s Las Vegas, a Mexican eatery serving up tortilla soup, burritos and other classics. 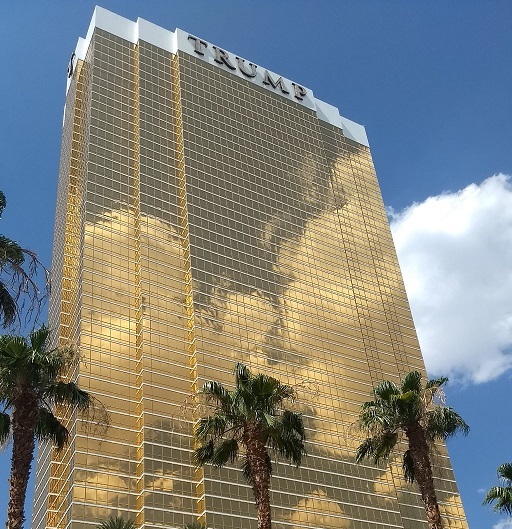 At night, the gold tower of the Trump International Hotel glows over the Las Vegas strip. Vacationers looking for luxury won’t be disappointed at this glitzy resort. Hilton Grand Vacations at Trump International Hotel offers accommodations include studio suites and one and two bedroom condo-style units. The spa at the Trump International Hotel offers a wide variety of services catering to all their guests, including teens and little ones which can opt for an ultra cute ice cream pedicure which starts with a chocolate soak and ends with a marshmallow mask. Adults can rejoice in exquisite massage services like the Las Vegas Night Jasmine massage, Moroccan Oil manicures and oxygenated facials. Three levels of luxurious accommodations are available to Trump International guests: guest rooms, suites and signature suites. All rooms include kitchens equipped with microwaves and dishwashers. Larger units include marble-top vanities, upgraded appliances and plenty of space. Dining at the Trump International Hotel is also an over-the-top experience. There are two restaurants in addition to opulent in-suite dining, DJT Restaurant and Lounge and H2 (Eau). DJT focuses its menu on contemporary American dishes like the house ground filet mignon burger and clam and chorizo linguine. To top off a perfect meal, indulge in the Sid Vicious, a cool cocktail served with a flaming absinthe sugar cube. If you’re lounging by the pool and not ready for a full sit down meal, head to the H2 (Eau) for a refreshing mojito, healthy smoothie or a fresh baked pizza. The Hilton Grand Vacations Resort on Paradise seeks to be a safe oasis for families visiting Las Vegas. There are a number of amenities that place families center stage including a video arcade, snack bar and full kitchens and washer/dryers in each room. Though onsite dining at a restaurant is not available, the marketplace grocery retails everything you need to make a kid-friendly dinner in-room in addition to prepared deli subs and sandwiches. An included breakfast is sure to make mornings easier. Accommodations are also optimized for families, with one and two bedroom suites that offer all of the comforts of home and some vacation privacy, too. Kids will delight in cooling off by the palm tree lined pool before heading to the game room. Adults looking to stay in shape during the often indulgent trip to Las Vegas can enjoy a complimentary fitness center. For your caffeine fix in the mornings, the resort has an onsite Starbucks, so you won’t need to miss out on your Frappuccino. 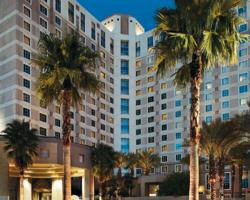 With so many resorts to choose from, staying at a Hilton Grand Vacations Las Vegas resort is an easy choice. The HGVC selection of resorts features luxurious details and on-site features such as fine dining, high quality entertainment, all supremely located on or just adjacent to the Las Vegas strip. Don’t forget we can help you own a piece of paradise in one of Las Vegas’ best timeshare resorts!